SAM STANTON knows from bitter experience the trauma his fellow teenager Alex Harris is going through after being crocked on the opening day of the new SPFL season, an injury which threatens to rule the winger out until almost Christmas. But, having been sidelined himself for more than four months after a knee operation, the midfielder today backed Harris to bounce back stronger both physically and mentally as he recovers from the broken ankle suffered in a challenge by Motherwell’s Shaun Hutchinson. Harris admitted to being “devastated” on learning the full extent of the injury, an initial assessment that there was no break overturned when the swelling around the joint subsided sufficiently to allow a closer examination. Stanton understands exactly how his team-mate is feeling having damaged ligaments in his knee after just two games of a loan spell with Cowdenbeath at the beginning of the year. 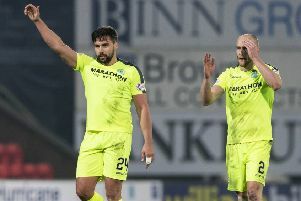 He said: “I’d gone there looking to get some first-team experience over the second half of the season as I wasn’t getting a game at Hibs but then I landed awkwardly in training and ended up needing an operation. “Having been through it myself, I really feel for Alex. It’s difficult picking up a serious injury at any age but particularly so when you are a youngster just breaking through to the first team and beginning to make a bit of an impact. “It’s really hard to take. When it happens you fear the worst but there’s also that little voice in the back of your head hoping it won’t be too bad, that you’ll wake up the next morning and everything will be okay. While the dedicated work of the club medics and physios heal the physical scars, Stanton admitted getting his head around an enforced period of inaction will also be a hurdle Harris will encounter but, again, he believes that the former Edinburgh Academy pupil will soon be focused on forcing his way back into boss Pat Fenlon’s plans. He said: “There’s not a lot you can do in these circumstances but do everything you are told by the physios. “Having said that, though, it can be hard when you are in the treatment room and you see the rest of the boys going out on to the training ground and then playing at the weekend. “You just have to think positively and, to be honest, I feel I’ve come back feeling stronger both mentally and physically. You realise just how much football means to you, that you cannot take it for granted, how different your life would be without it and that makes you all the more determined to work hard and make yourself strong in every department. Harris’ injury also dented Fenlon’s plans with another left-sided midfielder Paul Cairney ruled out for a similar period after the former Partick Thistle star chipped a bone in his ankle in training. As such, those injuries appear to have opened the door for Stanton who so far this season has made three appearances as a substitute, the second of which saw him replace Harris for the final 20 minutes of the Motherwell game. The fact he’d do so as Hibs appear caught in the eye of a storm isn’t lost on Stanton. The club have suffered four successive defeats with 11 goals conceded and none scored, culminating in defeat by Hearts’ team of kids in the first Edinburgh derby of the season, to pile the pressure on Fenlon. While Stanton admitted the current situation is a million miles away from life in the Under-20 side, he insisted he’s as prepared as any of his older and more experienced team-mates to restore an air of calm to Easter Road. He said: “Of course it’s a big step up for the younger players like myself, there’s more responsibility on your shoulders, greater pressure to do well for the team, the club, the fans as well as yourself. “Results haven’t been great so we have to deal with it. If we don’t win games people will be angry and unhappy. That’s fair enough. That’s the nature of the game but we can change things around by winning games.